Last week, the media exploded with reports that neurosurgeon Sergio Canavero is ready to transplant a body to a different patient’s living head. Russian programmer Valery Spiridonov has become the leading candidate for the operation. RBTH spoke with him to select the 10 most alarming and surprising facts about the upcoming surgery. A programmer from Vladimir (111 miles from Moscow), 30-year-old Valery Spiridonov, has become the contender for the transplant of his head onto a donor's body, which Italian surgeon Sergio Canavero is planning to perform. 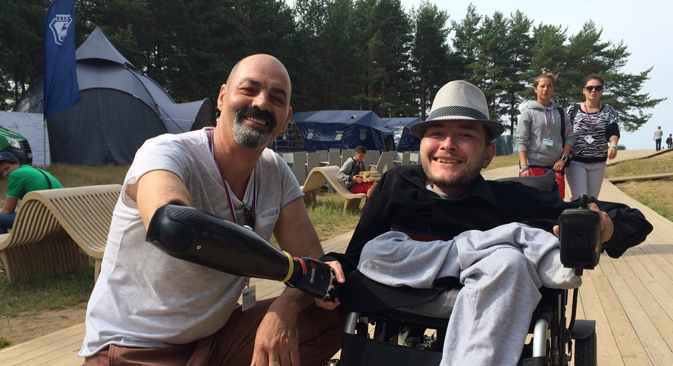 Spiridonov suffers from muscular atrophy, which will confine him to a wheelchair for the rest of his life. According to Spiridonov, he has resorted to this desperate measure to gain a new and healthy body while he’s still alive. Most likely, it will be taken from a person that has been in a serious accident or sentenced to death. His only wish is to get a man's body. "I just want this body to be a little healthier than mine," Spiridonov told RBTH. "In all other respects I can bring it to the desired condition with sports and nutrition. To choose a body is so far an impermissible luxury on the verge of folly." However, severing the head and connecting it to the body should not take more than an hour. "According to calculations, the patient will spend a month in a coma. This time is necessary for tissues to fuse. Then it will take about a year of physical therapy and rehabilitation to recover," Spiridonov said. "As for children, their genetics will come from the donor body, but it is still a subject for study," Spiridonov said. The professor has yet to collect the required amount. "Canavero does not have specific requirements for the patient," Spiridonov told RBTH. "But it certainly should be a person with severe bodily damage, who cannot be helped in any other way. A man that is doomed." Their first meeting is scheduled to take place at a scientific conference in the U.S.
"I contacted the doctor Canavero myself," Spiridonov said. "I've been immersed in the subject of such transplants and know about all the experiments that were done before him. Then I came across an interview, where he claims to have found a solution to the main problem – spinal cord fusion. I did not send any medical details about myself to Canavero. He is well aware of my diagnosis. It is manifested in quite the same way in most people my age. There has been no need for unnecessary trips so far." "He will try to do what I dream of," Spiridonov said. "But I cannot force him to do anything. There are no forecasts so far. Many of the details will be announced at a conference in the U.S. Perhaps there will be projections and expectations. Of course, the goal is the complete restoration of control over all organs and limbs. " It will be used to cut off the spinal cord. 9. For the head to work on a new body, the surgeon will need to "weld" severed axons, which are long extensions of neurons used to communicate with each other. They transmit information between nerve cells, as well as send signals to muscles and glands. "If I miss this chance, my fate will be unenviable. My condition worsens with every year," the programmer said. The idea of transplanting a donor’s head onto a body was conceived by Russian science fiction author Alexander Belyaev. In 1923 he wrote the book "Professor Dowell's Head." In the novel, surgeon Professor Kern secretly carries out successful transplantations of the head. However, it is not his own talent that performs the operations: it is the revived head of his former mentor and famous professor Dowell, who died under suspicious circumstances, that is the mastermind. The first experiment to revive a head was conducted by physiologist Sergei Bryukhonenko, who also created the world's first heart-lung machine, in 1926. Bryukhonenko demonstrated how the head of a dog – severed from the body and connected to an artificial system of blood supply – showed signs of life. In response to various stimuli, it blinked, licked and even ate a piece of cheese, which then fell out of the esophagus. The first person to transplant a head onto a donor body was Soviet scientist Vladimir Demikhov. In 1954 he sewed the head of a puppy with shoulders and front paws to a German shepherd. It lived only a few days. "The transplanted head was lively and reacted to its surroundings, had a meaningful glance and stared at people who approached it..." Demikhov wrote in his diary.